Thanks to an Awards For All grant, Hospital Radio Wey will be able to offer a free live commentary service for supporters with impaired vision at three of our local football clubs. 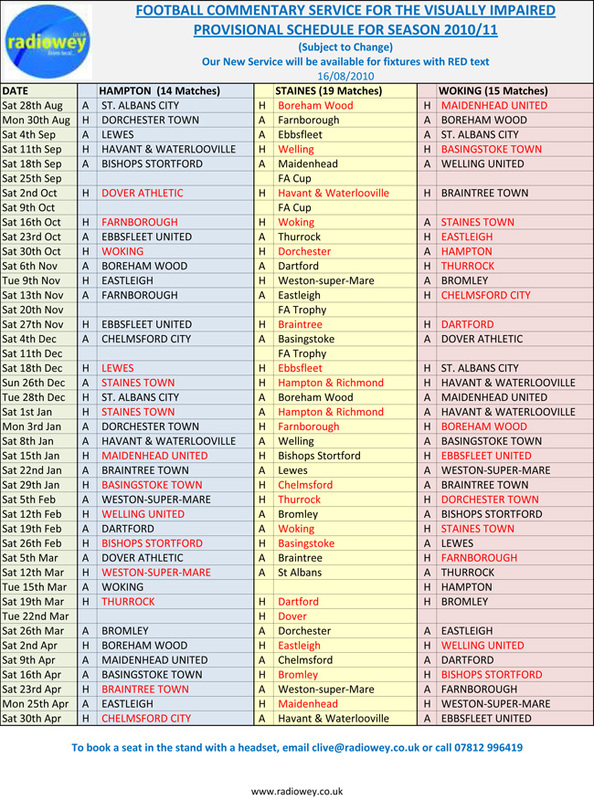 The service will be mainly at the three clubs in the Blue Square Bet South this season, Hampton & Richmond Borough, Staines Town and Woking. Visually impaired supporters can sit in the stand wearing a special headset so that they can listen to the same commentary being broadcast to the patients and staff of Ashford, Weybridge and St Peter’s hospitals, and on line listeners too. Nick Hornsey, Secretary of Hampton & Richmond Borough, said that the club is more than happy to accommodate Radio Wey’s new service, and look forward to working together. Jane Spong, the Community Officer for Woking FC said that the cub are 100% behind any initiative to support those in need in the local Community. Hospital Radio Wey have been providing local football commentary to patients and staff in Ashford, Weybridge and St Peter’s Hospital since the early 1970s. In recent seasons, the service has expanded considerably and the Saturday Sportscene Team are regularly covering five or six local matches every week, and often attract listeners from all over the world via the internet. Fans of Woking, Staines, Ashford, Walton & Hersham, Hampton and Chertsey have been known to have listened in from as far away as Sweden, Japan, and the USA. Clive, the Coordinator for Hospital Radio Wey’s Saturday Sportscene Show, said that this has been an obvious step for the station to take for some time, but only now are they able to do this thanks to the Awards For All scheme. He also said that if the reaction from Staines Town supporter Keith during a trial run at the Staines Town v Lincoln City pre-season friendly was anything to go by, supporters may want to book seats and a headset for all their clubs home games. Keith enjoyed it so much, he has asked for a headset for every game Radio Wey are covering at Wheatsheaf Park this season. It was the first live game Keith had attended for many years, and he said that it was so much more enjoyable being at the match rather than listening at home to the radio or TV. Radio Wey will be starting the new service at 3pm on Saturday August 28th at Wheatsheaf Park for the match between Staines Town and Boreham Wood, and also at Kingfield, the home of Woking FC for the visit of Maidenhead United. League Regulations state that although supporters who want to take advantage of this service will have to pay to be at the game, carers of visually impaired supporters will be able to attend the matches for free.